GBA Super Mario Advance (JPN) "Peach only" in 07:17.05 by mtvf1. Super Mario Advance is a remake of Super Mario Bros. 2 and Mario Bros. together on one cartridge. It features all the running, jumping, and veggie-flinging from the original Super Mario Bros. 2, plus new enemies and bigger items (and some annoying voice clips). In the updated arcade classic Mario Bros., you can play alone or against another player as you bump off baddies and collect coins. There's another very important difference between this version of Super Mario Bros. 2 and the NES version: when loading a savefile in this game, the player can travel back to any stage before the last one visited. This makes several new routes available through the game which involve warping forward and then going back to a previous stage with a different warp. 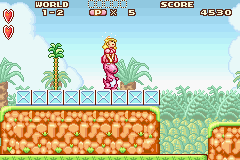 This run by mtvf1 plays through the Super Mario Bros. 2 mode with Princess Peach. Of course, at the speed mtvf1 runs and jumps across Subcon, you'd never guess she's the slowest character. For more information, including details about the chosen route, see the author's comments. If you want to see another run that plays with more characters, see this run.